Colleagues have always given my husband their leftovers when returning to the office after a lunch out. Friends tend to give me odd vegetables or half bunches of herbs or in this case, scallion greens. A friend recently had a bag with two bunches of scallion greens and a few whole scallions waiting when I came to pick up my son at his house. I made scallion pancakes (recipe is on the Seasonal Recipe Collection) and a simple dipping sauce of equal parts soy sauce and rice vinegar, with a bit of garlic and hot pepper. We only used about half of the sauce with the pancakes. Several nights later I found a quarter of a cabbage in the fridge and a bit of cilantro. There was rice in the freezer. I sautéed the cabbage, browning it just a bit. 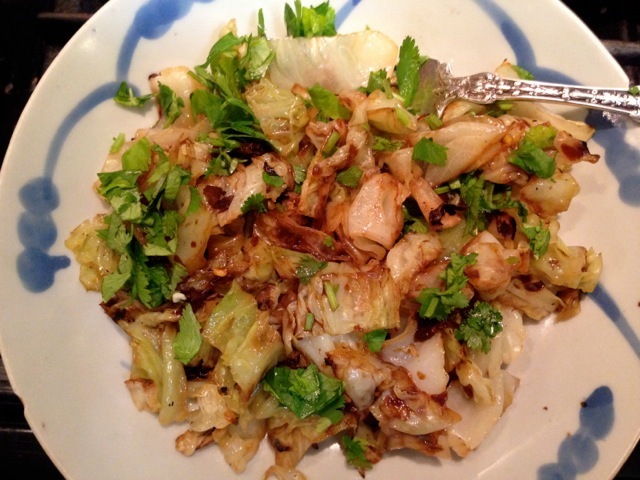 A few spoonfuls of sauce and chopped cilantro and my new favorite cabbage dish was born. The rice fortified everything nicely. A fried egg would have been good too. When thrift and creativity combine for this much flavor I must celebrate with a blog post. Happy cooking! Mix everything in a small bowl. Use with sautéed cabbage or any vegetables or grains or meats. This makes plenty of sauce for two meals for a couple of folks.